I got these a few weeks ago, but I don't think I had the chance to share them with all of you. I got these ginger blossom baskets at Joann's of all places. Can you believe it? The other great thing besides the fact that they are HUGE, is they were half price. I paid about 7 dollars a basket. Got get some!! I am now keeping my heap loads of scraps in them right now, and one is used for taking packages to the post office. I love all the compliments I get. The new sewing machine has been a godsend. I have not had a bad sewing day since I got it. I think my next purchase will be a serger since I am making Sophie some clothes now. Anyone know of a good, inexpensive one? Terri, she is a doll. 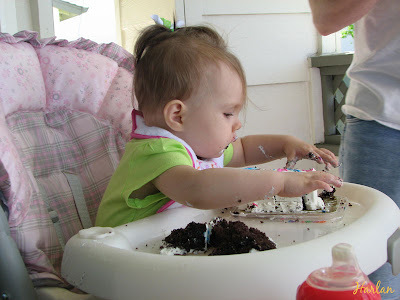 First birthdays are so great. 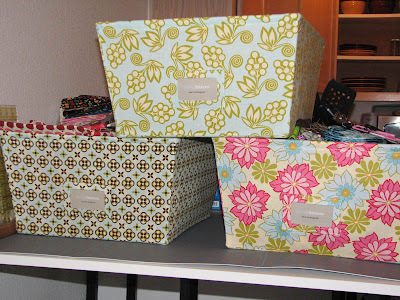 Love those bins, I have them too! What a little cutie! Happy birthday! If you are sewing clothing a serger is almost a must. You might check with your machine shops and see if they have a used one. A lot of folks are upgrading to the self threading ones and are turning in great used machines. I have a four thread Juki and have really loved it for years. My stepmom just bought a surger last year, and she researches things to death! I'm not overexagerating, either. Anyways, she found the best one and it was super cheap and from Joanns. I trust that it's a good machine, or she wouldn't have bought it. She's sewn for years and knows her stuff. My sister Andrea has sewn two dresses on it and it worked beautifully. I will ask her what it is and give you the name.